Written by the staff of 160over90, an international branding agency headquartered in Philadelphia, this book takes a chainsaw to the ubiquitous clichés of university marketing. Part advice manual, part case study, part competitive analysis, this quick read is riddled with wry humor and candid truths. The book offers insight into why mediocre marketing is rampant in the higher education community and provides tactics for avoiding common pitfalls. With a forward by Mirelle Grangenois, publisher of The Chronicle of Higher Education, this book is a must-read for any university marketing professional. It’s also got practical advice on every step of the branding process—from budgets to timelines to what the heck is an RFP anyway? "With a scholar's appetite for research, keen analytical skills and passion for vigorous and respectful debate, the team at 160over90 has unleashed their creative talents to address the lessons learned through their branding adventures in higher education. A fun and worthy read for anyone looking to unlock the heart and soul of their institution." "If everyone throughout our university isn't speaking with one voice our message can't be heard. The processes outlined in this book served us well as we transformed our school into a branding powerhouse." 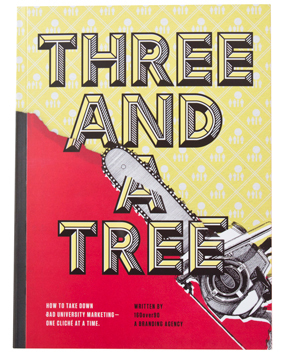 "'Three and a Tree' only begins to describe the clichés that riddle higher ed work. This book is a funny, but super informative, look into how to begin looking at your job completely differently." "I recommend this book for presidents, provosts, board members, communications staff or anyone who is truly dedicated to transforming their organization's brand message."